My new boots have been a godsend in this weather as they're super comfy with deep tread on the soles, perfect for slippy conditions. 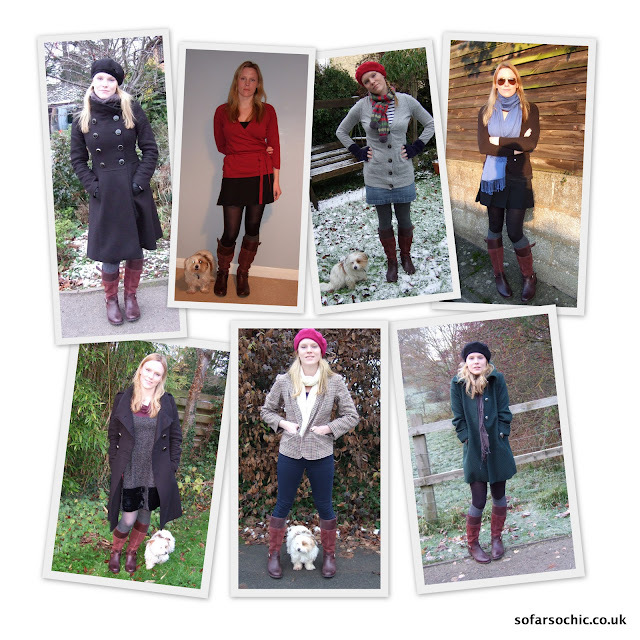 I've been wearing them with skirts, jeans and leggings and have found them very adaptable. They also have good, strong zips that stretch the whole depth of the boot so they're easy to get on and off. I love the burgundy colour: rich jewel tones look good in autumn and winter and liven up a plain outfit. My Bethel Buckle Tall Zip-Up Boots also come in light brown, dark brown (even though this colour is missing from the website) and black. The dark brown ones are lovely. As I said in my previous post, my calves are smallish so I have the fastener on the tightest notch. This makes for a snug fit with no bunching of the leather. There are three different notches, which I think would fit most average-sized calves. Made from a mixture of leather and soft nubuck, they mould quickly to the shape of your feet. The insole is bouncy and supportive. I did find them quite narrow and had to size up from my normal 7 to a 7.5 but they fit perfectly. My mum and I have been cracking up at Charlie the dog creeping stealthily into all the photos. The fact is, he's always by my side! He likes my Earthkeepers too because they're perfect for walkies! Love that photo of you in your green coat with your berret - you look beautiful. Also LOVING Charlie... little cutesy munchkin. charlie is SUCH a photo whore! Isn't he just! It's like Where's Wally! I would love some of those boots, they are fab!